Spending time in the beautiful, expansive grounds at the Manor at Weston-on-the-Green could cause you to think that you'd fallen down the rabbit hole. The combination of stunning croquet lawn and immaculate animal topiary could means that you half-expect the Queen of Hearts to appear chasing a white rabbit. Exploring a bit further, and I was sure I was going to stubble upon the doorway to the Secret Garden. This place feels like it's straight out of a storybook. Last weekend, I stayed at the Manor at Weston-on-the-Green in Oxfordshire and, for 24 hours I almost completely forgot what century I was living in. 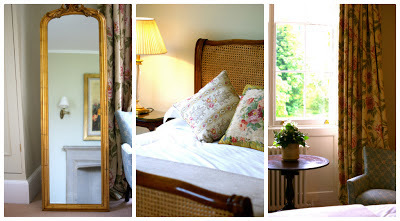 The picturesque manor house has been recently refurbished and the guest rooms, each named after an historic figure connected with the house and the surrounding area, are individually decorated to reflect the history of the building. Everywhere, from the cosy bar to the bright morning room have also been refurbished to show off their breathtaking features. It was a brilliantly relaxing experience, due largely to the tranquil surrounding and the hotel's attention to detail. Every part of your stay is carefully considered from the moment you arrive to when you checkout, from the fruit bowl in the room, slippers laid out by the bed as part of the turn-down service, to your choice of newspaper in the morning. Dinner was served in the 11th century Baron's Hall which, given its vast size, is surprisingly intimate. 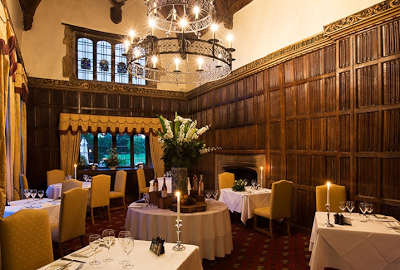 The dark wood panelling and candlelight give the experience ambience without being too dark to see your food! (It was too dark for any decent photos of the food, which is a shame because it looked amazing.) You can choose between the tasting menu or a la carte, we opted for the a la carte menu, mostly because was better for my gluten free needs. I'm quite glad we did, because there was no way we could have eaten five courses – three almost defeated us. The new head chef has put together a brilliant seasonal menu that's full of tempting dishes. The trio of seafood was a standout starter for me and the slow-roast pork belly with granny smith apple is definitely worth a try! The waiting staff were so attentive that, despite being really busy our waiter even offered to ask the chef to whip up a dessert that wasn't on the menu. The Manor at Weston-on-the-Green is the perfect location for a romantic mini-break, especially if you love quaint villages, market towns and naturally beautiful countryside, or for a girls' escape – Bicester Shopping Village, need I say more?! Rooms start at around £175 per night, or £485 for a four poster room. The 4th image, The Baron's Hall, is used with permission from The Manor at Weston-on-the-Green. I was their guest for the evening.